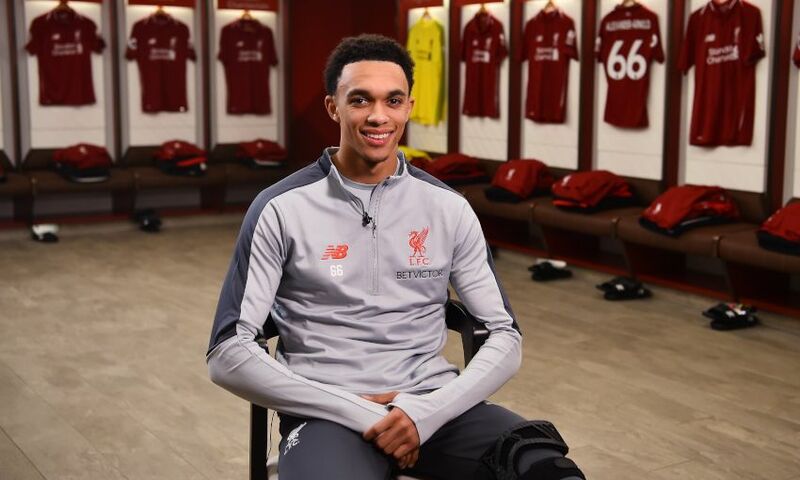 Trent Alexander-Arnold inked a new long-term contract with Liverpool on Saturday morning, ensuring his lifelong love affair with the club would continue into the years ahead. The defender put pen to paper on the deal to extend his stay as a Red, having arrived as a six-year old and progressed through the ranks of the Academy and into the first team where he’s now made 67 appearances. 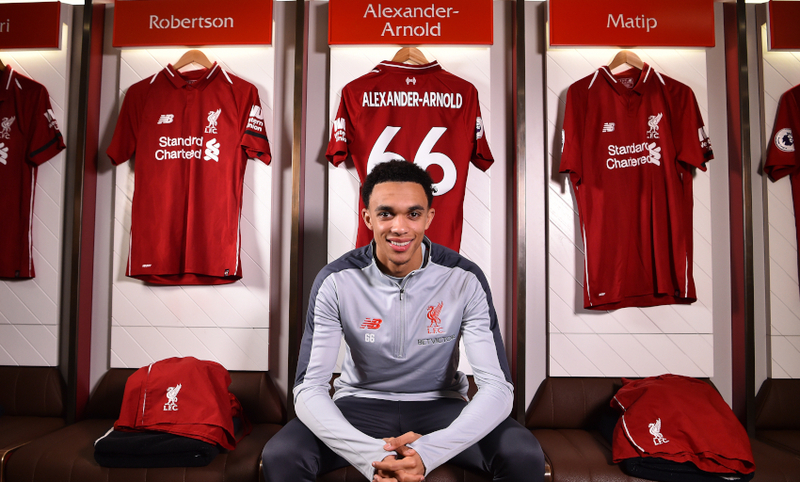 Shortly after adding his signature to the contact, Alexander-Arnold sat down with Liverpoolfc.com to talk us through his emotions as well as outlining his hopes and ambitions for the coming years. Watch our exclusive interview with the 20-year-old now, or scroll down to read the full transcript. 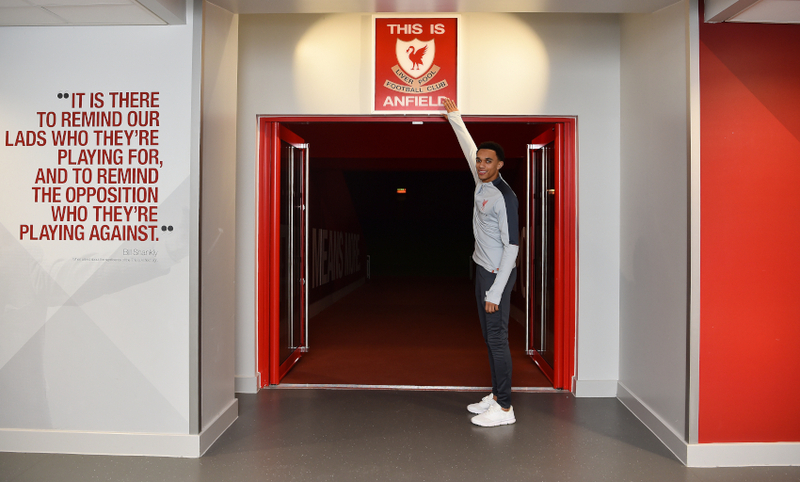 Trent, congratulations on signing a new long-term deal with the club. How does it feel to have it done and dusted? I’m ecstatic and really proud. I feel privileged to have the support and the trust the club has in me to offer me a new deal. There was no doubt in my mind to sign and extend the years I have with the club. Hopefully we can achieve a lot of success in those years. Is it fair to say you were eager to get this done and commit your future to the club? Yes, definitely. There wasn’t a doubt in my mind. As soon as they offered the contract, there was no hesitation whatsoever. The thing that made it easiest for me was having the people around me to make sure I was able to focus on football as much as possible and get the deal done as soon as possible. That is down to my brother especially, my manager, who took that role and allowed me to focus on football and not get distracted, which is the main thing. What’s the feeling now that it is done and you’ve signed a new long-term deal? It’s just a feeling of pure pride within yourself. It gives you a bit more motivation to work harder because you know the club and everyone around the club – especially the manager – have the trust to say they do want me for those few more years. And he [the manager] puts that trust in and thinks you are part of his future plans as well, so it gives you that motivation to work hard and make sure you do him proud. Yes, definitely. I think there are things that have happened that were beyond my wildest dreams. Football is a very special game and there are things you want to happen; there have been a lot of ups and few downs, but that’s part and parcel of the game. You can’t only have a steady rise and everything going smoothly. The last 18 months especially have been very special. Hopefully the next 18 months and even further on than that will be even more special. How do you think you’ve developed as a player since then? I would say the main thing is I’ve matured. I think that is down to the manager’s trust in me. Especially on the pitch, I have matured and got closer to the lads. I feel a bit more part of the team now; I feel like I am fitting in well with all of the players and feel like I am being myself more in the changing room. As a young lad, you’re always nervous and you never fully come out of your shell, but I think over the last 18 months I’ve come out of my shell, I’ve started being more vocal on and off the pitch and that’s down to all the lads and the staff who’ve made me feel welcome and at home at the club. It’s safe to say I do feel at home. Yes and that’s important. To be in and around your teammates every single day, you’ve got to have bonds and friendships - that’s important for every player in every team to get on well [with their teammates]. We all have the same idea that we want to be successful, we want to win trophies, we want to be the best team we can and that comes with communication and putting yourself on the line for the person next to you. The whole squad has been fantastic, it always has been since I first came up here. Now more than ever, we’ve got that team bond that’s really special. Definitely. I think you see that out on the pitch – especially this season more than ever. That we have that desire to work hard for each other and put ourselves on the line for each other. That’s what every good team needs and that’s what we’ve shown this season. Hopefully there will be a lot more of that and it’s only bright for the club going forward. Who has had the biggest influence on you in getting to this point? I would say my family, the manager and the players. A main one for me would be Hendo, especially around the time of the World Cup and I was new to the England set-up. He was one that really looked after me and we created a very strong bond over in Russia. We’ve been close ever since. It helps as obviously he’s the captain and such a senior player, he knows what advice to give me when maybe I am not in the team or when things aren’t going well. He knows what to say and he has helped me through this season. This has probably been a season where I’ve played a lot of games, which is what every player wants to do, but to cope with the expectations of such a great club can be hard for a young player. When you’ve got those kind of people around you, it takes the pressure away from you and you can focus on being the best player you can be. They are the type of players that can push you. When you see the senior players going in the gym every single day and working hard, it gives you the motivation to do the same. Yes, definitely. The young lads coming through have got a lot of potential, but they all understand it takes a lot of hard work to push forward and to establish yourself. They’re all willing to do that and hopefully the young lads see me as a bit of a role model; that’s what every player wants to be, a role model - whether it’s for the fans, for young players coming through or people at the Academy. You want to set a benchmark that others can follow. Hopefully I am doing that with the way I act around the training ground, just as when I first came up I saw the young lads at Melwood acting the right way with the right routines that could help them perform on a daily basis. Is it possible to pick out a highlight of the last 18 months? I would just say the main thing is the support from the fans that I’ve had that I probably didn’t expect to have. I’ve always wanted it but never expected it. Just to have the support of the fans every single time I go out to play, to know that they’re behind you is something special. I don’t think they understand how much they do for the team and how much we all really need them. They’re turning up every single game – whether home, away, abroad, whether it’s freezing cold, they are still there and singing their hearts out for us, showing how much they love the club and how much they love us as players. It’s our chance to repay them with performances and the things we can do on the pitch. So, it’s probably the support from the fans that’s been the best thing for me. Being from the city, being a Liverpool fan, that must make everything you’ve achieved so far that little bit sweeter? Just having the pride to go out and wear the badge when you’re chosen to do so is something that spurs you on; it gives you confidence and motivation to go out there for the fans and try to perform. Effectively you’re living all of their dreams just as when I was a kid, the players on that pitch were living my dreams. Hopefully that’s what the kids see these days when they see us going out onto the pitch – hopefully they want to come and support us. It is, definitely. It is a very exciting time with the players we’ve got and the talent we have within the team, the manager is going about it in the right way and it is hard not to see the exciting project that is going on. That’s what the manager is doing. When he first came in, he was never expected to come over and win everything in his first season, but he laid markers and foundations for us to be successful in the coming years. Hopefully we’re going out there and proving he is doing the right things. Hopefully we go out there and do what he wants us to do. With the right messages and listening to him, we’ve got a chance of being a successful team. How much are you enjoying the current situation in the Premier League, fighting it out at the top of the table? You’d rather be at the top battling it out than at the bottom. You get the pressures that come with it, but it is something that is exciting, something that maybe not many players have been able to do. You enjoy it, there is no better feeling than being at the top of the table in what’s probably the hardest league in the world. The old cliché that there’s still a long way to go is applied on a daily basis – we know there is still a lot of hard work to go into it and we know it’s going to be tough, but we have the squad and the manager to hopefully keep getting the results on board and be as successful as we can at the end of the season. The full-back position is fundamental to the team’s style of play, both defensively and offensively. How pleased were you to see Andy Robertson sign a new deal too? It’s massive. It’s thoroughly deserved for Robbo. It’s great for him and for the club. He has shown over the last year, year-and-a-half, how good of a player he is with the rise he has had. He has turned into a world-class player. I think he’s always had it in him, but at the start of last season he never had the chance. But when he was given the opportunity he grabbed it. He is also a role model for young players, which is important. He has come into a new club and for the first half of the season he never really kicked a ball, but he never let it get him down and he has shown his passion for the club. I think that’s why the fans and the club love him so much because of the hard work and desire he has – he goes out there and proves he wants to win and is proud to wear the shirt. That’s all the fans or anyone can ask of any player – to go out there and fight for the club. That’s what Andy does every single time he gets the chance. Yeah, it’s assists and goals so I have got my free-kick in there! It is healthy competition between us two, we push each other and there is never any negativity towards it. We don’t focus on it too much either, which is the important thing – you can’t let it take over and you’re trying too hard because it’s in your mind. You’ve got to play for the team first and foremost. Then, at the end of the game, if you’ve got an assist or goal then you’ve helped the team get the result. The team comes first and foremost, as does the result. Whether it’s him or me who wins, the main thing is to win games. It’s good for everyone to get involved with activities off the pitch as well. A lot of the lads play pool, some play a bit of darts and things like that. It is good to see the different players coming in and having the confidence to go on the pool table in front of everyone in the canteen. Whenever people get the chance to do so, then they do. It’s also good for bonding, people can have a laugh and just relax and be themselves. It’s important to do that at the club. It’s still hard to get my head around it, but that’s a true statement. It still is a dream come true and every day when I wake up, it’s still a bit surreal and you can’t wait for it to carry on. Hopefully I’ll be a lot more successful, with a lot more silverware and trophies and be able to be a real part of this club’s history. This is just the start for you, but have you allowed yourself any time to look back at what you’ve achieved so far? I think it’s important maybe at the end of a calendar year or the end of the season to look back on what you’ve achieved. It’s something I like to do, but I know the future is also very bright as well. Who knows what it holds? That’s something to get excited about and it’s better to try to look into the future and set aims and goals, to put in the hard work to try to make sure they come true. It’s a long-term deal you’ve signed – what are your targets in both the short-term and longer-term over the course of the contract? I think the main thing is trophies and silverware for the club – that is massively important for the club, the players, the fans and the manager. For everyone involved with the club, it is massive. It is definitely trophies and being a successful team, that’s the main thing for the club and definitely the main thing for me. In terms of you as a player, do you feel there’s still plenty of room for development? Yes, definitely. There is still a lot of hard work to go into it. I think there is probably still a lot more potential to be seen and uncovered. With the hard work and the right mentorship from the senior players, the mentorship from the manager and coaching staff, from the family and friends leading me down the right path, and the hard work I put in myself to become as successful as possible and, like I say, to try to be a part of the club’s history. It’s not just bringing the team or the club success that you’re invested in – you also like to try to make a difference in the local community. Why is that important to you? It’s massive. Whenever given the opportunity for someone to give back to the community, to give back to people less fortunate, it’s definitely something that should be done more often. When I get the opportunity, I try to do as much as possible. It’s important, it’s healthy for people and hopefully people in the city and people around the country and the world can see the work that is being done [by the charities]. Hopefully it will encourage people to do the same as well. All it takes is a bit of time – it’s not so much money, just time. A bit of time and effort to give to someone and it can change their lives. I think the greatest goal of them all is to say you’ve changed someone’s life for the better. If we were to sit down again in another 18 months, what would you have hoped to have achieved? Probably, again – I know I am repeating myself – but trophies. As many trophies as possible. That’s the one thing I think is driving me the most. I think everyone in the team would say it, everyone is trying to be a winner, no-one likes losing. The main thing for us is to win things and bring success back to the club. Lastly, what would you like to say to the supporters on the back of signing your new deal? I would just like to say a big thank you to them for all the support and the love they’ve given me and the team. It is something I can never repay them enough for. Hopefully I will be able to give them happiness over the next few years – and hopefully even longer.